How can you understand if what’s in your hands is really a silk velvet? Apart from looking at its label, of course, you can find it out with your own eyes and hands. Identifying it won’t be always easy, though, but there are some elements that may help you. What is a silk velvet made of? 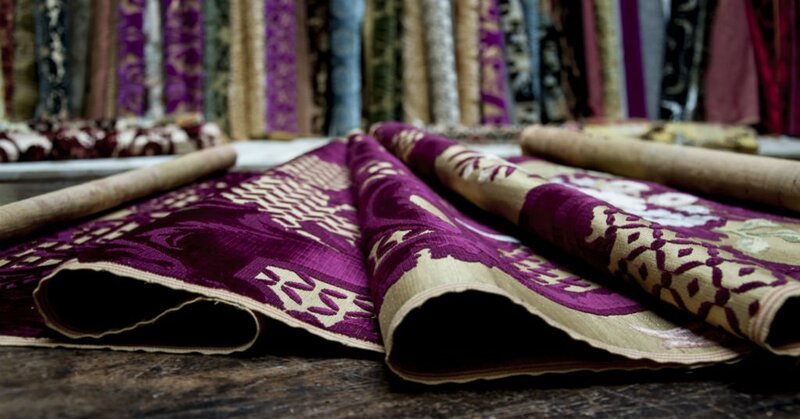 The element that distinguishes velvets from all other fabrics is their pile, the soft surface that caresses your hands as soon as you brush it. So what determines the brightness and softness of velvet are the fibres chosen to make the pile. And the handmade velvets created in our Tessitura are warp-pile velvets, which means that the pile consists of threads arranged warpwise. And now things get more interesting: velvets don’t have just one warp and one weft, but at least 2 warps and one weft. The first warp is the ground warp, which creates the fabric’s base by intertwining with the weft. 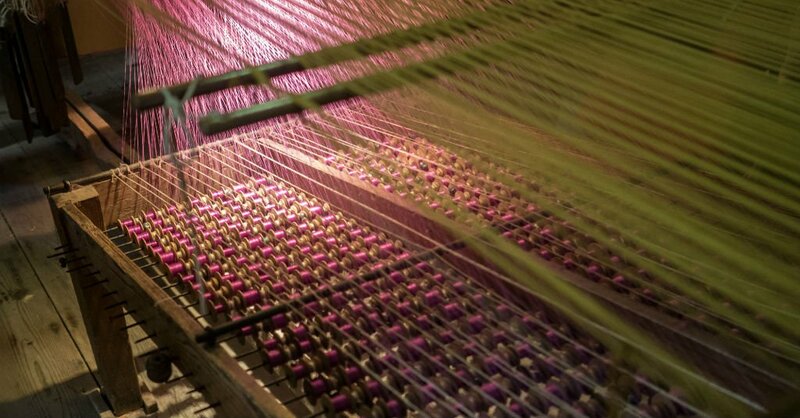 On our looms, its threads are rolled up around a beam, a large cylinder placed at the end of the wooden frame. The other warp is the pile warp: its threads wrap around the velvet irons to create the curly velvet, or they are cut to generate the cut velvet. 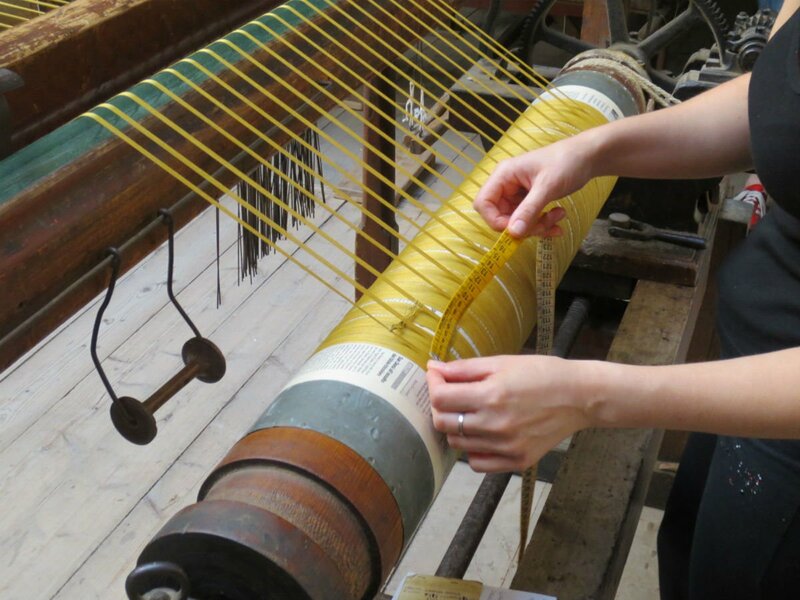 These threads come from the bobbins placed on the rack, the framework located under the loom. When we talk about silk velvets, then, we’re indicating the kind of fibre its pile is made of. That’s why, if you consider the composition of a velvet such as the soprarizzo Giardino Antico, you’ll see that its ground consists of 70% silk and 30% cotton, whereas the pile is 100% silk. synthetic fibres, such as polyester and nylon, generate shimmering velvets, but their drapery isn’t soft, and they’re heavy. As you’ve seen above, distinguishing one velvet from another isn’t simple, because sometimes they combine different fibres. As far as our velvets are concerned, though, we only mix them in the weft or in the ground warp, where we use cotton and linen to get a stronger fabric. Linen, for instance, is useful when we need to get a rigid weft, thus improving its performance and durability when employed for upholstery.